Kieran McLaughlin pictured at a previous court hearing. A 60-year old Derry man acquitted of the murder of Barry McCrory has been told he will serve a minimum sentence of ten years for firearms offences. Kieran Edward Joseph McLaughlin - who Belfast Crown Court heard has a “deplorable record” for similar offences dating back to the 1970s - went on the run in the aftermath of the October 2013 murder and “armed himself to the teeth” in a bid to evade capture. 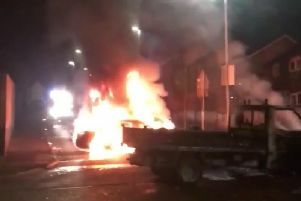 McLaughlin, who was on licence when he was caught hiding under a car six days after Mr McCrory (35) was gunned down at a flat in Shipquay Street in Derry, was deemed as presenting a significant risk to the public. Ordering McLaughlin to serve a minimum ten year sentence, Mr Justice Horner pointed out that, when McLaughlin was arrested, he was in possession of several weapons including a fully loaded sawn-off shotgun and was in breach of a licence imposed for previous offending. McLaughlin, formerly of Elaghmore Park in the Galliagh area of the city but whose address is now HMP Maghaberry, denied murdering Mr McCrory and stood trial at Belfast Crown Court earlier this year. Following the non-jury trial, on March 27, Mr Justice Horner concluded that the murder charge had not been proven to the requisite standard and, subsequently, found him not guilty. The father of six was, however, found guilty of possessing firearms and ammunition with intent to endanger life, and possessing an imitation firearm. Prior to the start of the trial, McLaughlin admitted having the guns and ammunition in suspicious circumstances. At a previous court hearing, Crown prosecutor Ciaran Murphy QC spoke of McLaughlin’s previous offending for firerms offences which began in the 1970s and was repeated each decade. During the course of the trial, the court heard, how in the aftermath of Mr McCrory’s murder, McLaughlin went on the run when he knew he was wanted for police questioning. He was arrested in the early hours of October 16, 2013, after being located lying under a car in the Rossnagalliagh area of Derry. When apprehended, McLaughlin was in possession of a sawn-off, 12 bore double barrelled shotgun, shotgun cartridges, a Mauser self-pistol and ammunition as well as an imitation Walther pistol. When he was searched, various items were located on his person including two knives, a pair of night vision glasses, a black balaclava and newspaper cuttings about the murder of Mr McCrory and the search for him. During the course of today’s sentencing, it emerged that, while McLaughlin was initially housed on the dissidents’ wing in Maghaberry Prison, he was currently in the Care and Supervision Unit in Magheberry, which accommodates prisoners who are under threat or at risk. The court also heard that McLaughlin claims to have mental health problems including anxiety and depression - but there was no medical report before the court regarding this. Mr Justice Horner also set out a number of reasons why he believed McLaughlin presented a risk to the public. These reasons included McLaughlin’s “willingness” to resort to the use of firearms “on a regular and repeated basis throughout his adult life”, the “complete absence of remorse and no hint he regrets his behaviour”, and also McLaughlin “arming himself to the teeth” whilst evading questioning from police. Ordering McLaughlin to serve a minimum period of ten years in prison before he is considered eligible for release, Mr Justice Horner said the substantial sentence was imposed not just to deter McLaughlin from further firearms offending, but also to act as a deterent to others who may be tempted to involve themselves in gun crime. The Judge added: “While in this case the defendant was not a member of a terrorist gang or carrying our terrorist related activities, he has demonstrated a continuing determination to offend in a most heinous manner.